I like picking up the free magazines from grocery stores. I like flipping through them on my way home. I will flip them just like how I do to fashion magazines while watching the television. Then I will leave them aside only to flip again when it's time to clean up the magazines section. Why bother flipping and browsing through the magazines again when I decide to recycle? Good question. Lot of time it will make it a lot more difficult for me to not recycle. Sounds like hoarder wannabe, eh. It's nothing interesting. 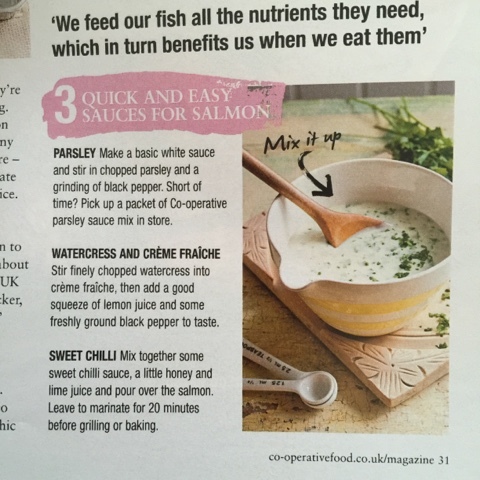 It's just quick and easy sauce recipe for salmon. Both hubby and I eat lots of salmon. Can't wait to try this 3 simple ideas.